Halloween, my favorite time of year to perform. Halloween is my favorite holiday of the year. Not only that, but it is my favorite performance season. Why? Because I can become a character and be theatrical and fun with my audiences. I can be a friendly Witch and actually manipulate fire in front of an audience that is so flabbergasted that they think it is completely fake. I can be an actual sorceress for people. And even after I tell them at the beginning of the show that it is actually real fire, I still hear them talk among themselves trying to figure out where the fake fire comes from and how the "trick" works. It isn't until I get up close where they can feel the heat that they understand that it really is real fire. Or until I breathe fire and they can feel the intense heat from 15 feet away. It is just so much fun performing to my favorite popular Halloween music. Music that everyone knows and loves and they can really connect with and get into. Some of my favorites are fire hula hooping to the Ghostbusters theme song as you can see in the video below. Or fire breathing to Michael Jackson's Thriller while moonwalking. I also use songs such as Marilyn Manson's version of The Nightmare Before Christmas theme song. Every fire act is choreographed to the music and performed in such a way that draws audiences in like Sarah Sanderson's "Come Little Children" scene from Hocus Pocus. Not only do I enjoy performing with fire for Halloween in Massachusetts and other New England states such as Connecticut and Rhode Island, but I absolutely love bringing my unique stilt walking costume to events. 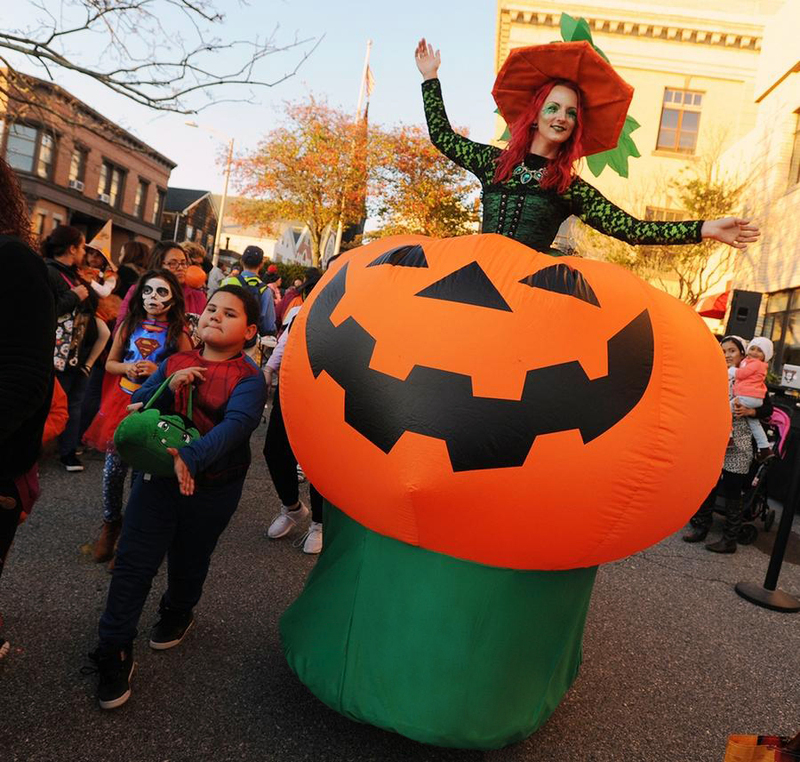 I created a one-of-a-kind stilt walking costume where I am a Witch popping out of a giant inflatable light up pumpkin. As far as I know, this has never been done before and it is a HUGE hit! I didn't get to complete it to my heart's desire last year so this year it will be even better. But it is big, beautiful, and has custom lights inside that I can change depending on how light or dark it is outside and the mood of the event. This year, I will be adding the finishing touches with pumpkin patch leaves and ivy on the bottom skirt. 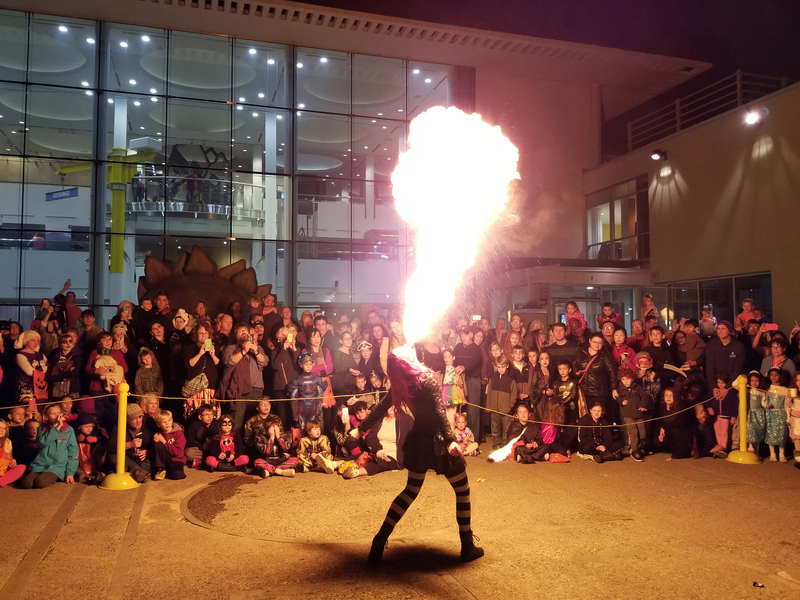 If you want to keep your guests talking for years, book a Halloween fire show or stilt walker today! This is perfect for all ages, 0-150 years old. Kids are especially fond of the show and I always enjoy answering their questions after the show and taking pictures with them. I am also available for both family friendly and adult sideshows which feature interactive and painful entertainment! Walking on broken glass with a 200 pound person on my back, eating lightbulbs, climbing machete ladders barefoot, laying on a bed of nails, painting your picture with a paintbrush shoved 6 inches into my nasal cavity, swallowing a 3 foot long balloon, and much more!